Meet To Sleep in January, 2016 was a collective action co created by Girls At Dhabas, Pakistan and Action Sheroes, Heroes and theyroes in Pune, Bombay, Bangalore, Delhi, Jaipur, HyDERABAD and Why Loiter, Mumbai to name a few. Action Heroes: Joshua C.D, Susan Jose, Vikash Lohia, Arvind Thyagarajan, Anubandh, Rutuja Chitra, Pranita, Sandhya.S, Madhu Shukla, Vijji Chari, Yogesh Dilhor, Harini Vasudevan, Vijaya Savithri, Priyanka Pai, Tom Krippner, Chitra. B, Sachi Raval, Manasvini Shankar, Tansushree Borundia, Kiri Meili, Megha R. Mehta, Vira Mistry, Jasmeen Patheja. Lying down with my back sinking into the earth below while my eyes found a beautiful view above, filled with so many shades of green , intertwined branches and the sky that faded into infinity. I felt safe, to doze off, to dream , to dance in the warmth of the sunlight. Each leaf on the branches above me was there because it received the warmth and the light of the sun, me lying down under this beautiful foliage was possible because I felt the warmth of safety. I felt safe, to doze off, to dream , to dance in the warmth of the sunlight. Each leaf on the branches above me was there because it received the warmth and the light of the sun, me lying down under this beautiful foliage was possible because I felt the warmth of safety. I realise that my years of conditioning and experience probably did not allow me to relax. And to truly occupy the space fully.. is not just to be able to do it physically (which is a great step forward) but also to do it mentally and emotionally. Which I wasn’t able to do completely . And that is an important insight for me. When my 11-year old daughter was hearing the adults share, she kept whispering back to me, "what is the big deal about sleeping in a park". While she may be too young to understand this, my hope is that with movements such as these, she would continue to ask this question even as an adult woman living in India. We chose Hiranandani park as it was decided by the Mumbai participants. This is a pay and enter park and mostly couples come here. Very few families were present. There was noone to take permission from the Municipal authorities and we just went ahead. Maybe for the next event of Meet to sleep, we will try to take permission for it. Getting over the fear of sleeping in the park, doing something I hadn't done before and being vulnerable in such a public space was interesting. The experience was worthwhile. I had never slept in a park before and this was the first time so it was interesting. I got to argue with the guards and fight a bit with them to let us sleep in the park, which we couldn't do for much time. But we managed for sometime at least like 20 mins. It was an interesting and fun experience overall. 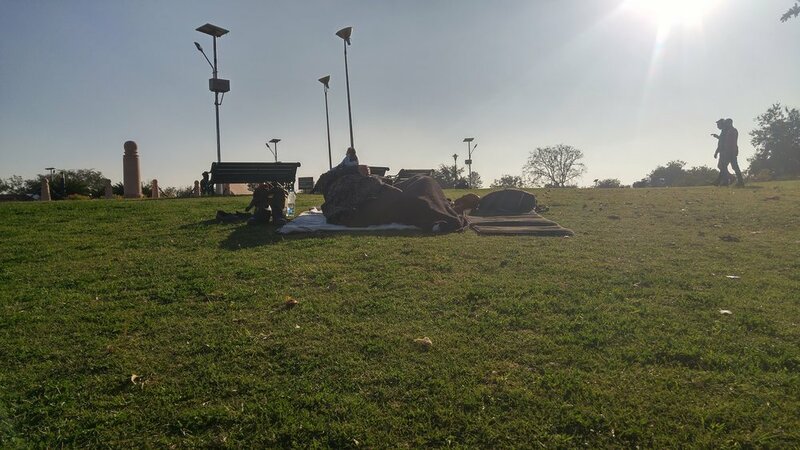 I joined the Meet To Sleep today because for the love of sleeping in the sun in winters without feeling scared, in company and maybe we all will individually reach a point where we can do that alone as well. I don’t know can we just decide to trust and like live our lives that way and what happens if we do. and the last thing I’ll say is I’d like to pull out this statistic , “ men are far more likely to be attacked in public spaces than women. The reason that women are told to fear is because the way in which they might be attacked can be sexual but like if you’re walking around alone and you’re a dude then you are much more likely to have something physically happen to you and no one talks about that ever. Thank you for this event whoever is organizing this and I just came out to hang out with my friends and at the same time apart from having fun with my friends I kind of like felt the purpose of reclaiming the public space. And thank you for that. It just struck me that I always actually after lunch if I get time in the university law I just go out and sit there. and umm it’s slightly different outside than this area because definitely we feel different, we feel much more safer in the campus. Everyone tells me you’re in Delhi you should carry a pepper spray with you, I refuse to do that. Because I don’t want to live in that constant fear that because I’m a woman and something will happen to me. I might be able to do this again and again given that I saw quite a few men sleeping randomly while coming here. But to do this in such an organized manner… and maybe to learn about what your experiences. I think that adds to its value. And it feels good coming here. I came here just to sleep and it was really nice. I’m not from Delhi, I came here from work. I thought I’m getting an opportunity to sleep in an open space with people with the same kind of outlook. I came here especially to take a break from work because this is something so rare, women just lounging around in a park and just chatting or even sleeping. I must admit the thought of not being in control in a public park petrifies me and it is precisely because of that that I’d like to do this. Action Sheroes: Barathi Nakkeeran, Sanjana Srikumar, Meghna Sengupta, Aditi Ameria, Divya Gupta, Pragati K.B. While I was lying down, I was oblivious to the curious stares I might be getting and was lost in trying to sleep and have a good experience. There's something very charming about napping under the sun, surrounded by nature. 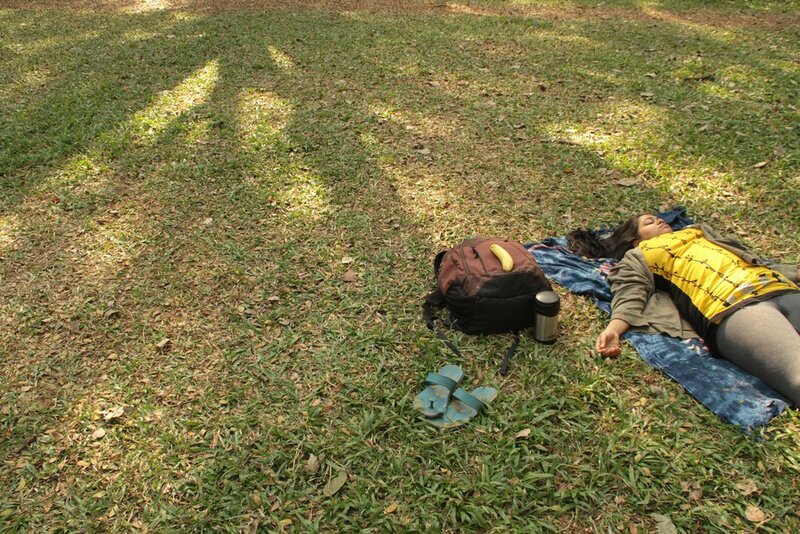 We spread across the park to better take in the nature and doze off in peace. I am still unsure of whether this is something that I would do alone, when I know that my peers are not in the vicinity. Lying down to sleep or curling up with a book in a park seemed natural, once I got down to actually doing it. I did notice some glances but eventually I was lost in my own world. And I would definitely do it again, though probably not alone. This was a very different experience. It was like there were stages of the experience. First there was over enthusiasm, when we heard of the project. Right before we started, there was nervousness. After we spread our bedsheets, there was a strange feeling of awkwardness slowly, comfort took over. Then came relaxation. Finally, when we got up, there was rejuvenation. Definitely something I'll continue for the rest of my life. Since it was our first time, the fear hasn't gone completely. Maybe after one or two Meet To Sleep events, the fear of sleeping alone will be gone. When we were sleeping, another female slept next to us. It's probably because we tend to look for company or some similarity between us and others. 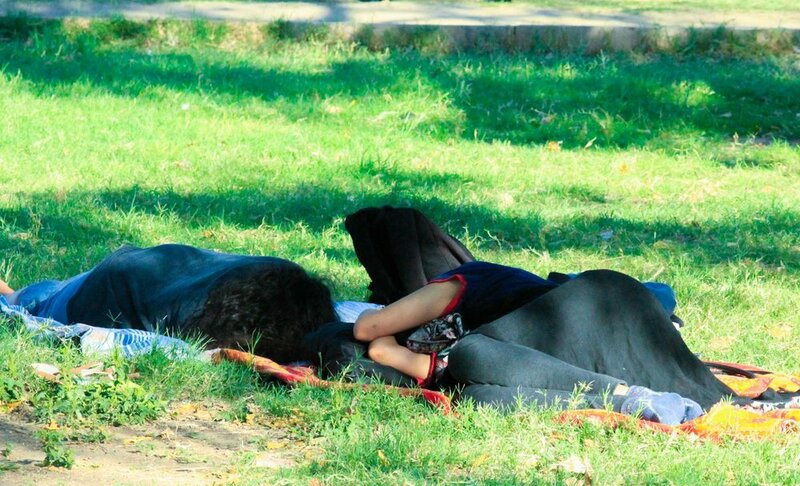 This was my first time, sleeping in a park. Initially, it was awkward but later on I got comfortable. Overall it was good and a different experience. 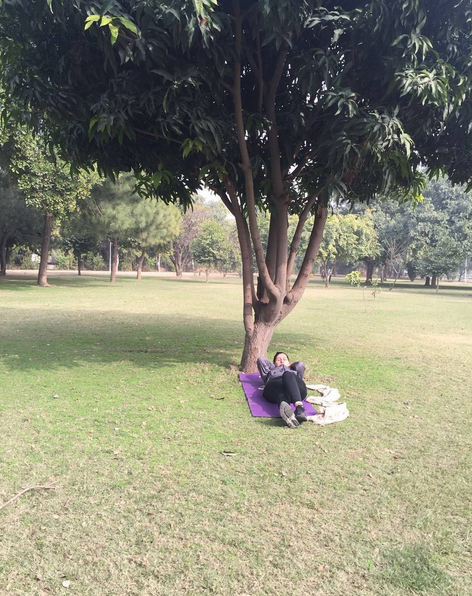 I paid ten rupees to step into the park and squinted around looking for the rest. The man at the gate pointed towards the left ‘aapki dostain udhar baithi hain’ (your friends are sat there) . We have already been identified as a group, an anomaly. But I nod and join the rest. We are four girls. Two of us are well prepared to ‘sleep’ and have brought sheets, neck pillows and things to read and munch on. We walk around looking for shade. The park is pretty enough but not very clean. Couples have occupied most of the more comfortable spots. They look at us while we walk around. The women are in abaayas but many have taken their shoes off and sit close to the men they’re with. There are groups of men too; loitering about, on the phone or smoking. Nobody says anything as we settle down and get comfortable. It is too early for me to sleep and I’m too distracted to read either so I flip through a magazine and look around. A couple nearby has moved away. A man walks by and glances at the cigarette in my hand. Beyond that, it is almost serene. We munch on biscuits and talk a little but mostly we just lapse into our own thoughts. One of us even manages a short nap!